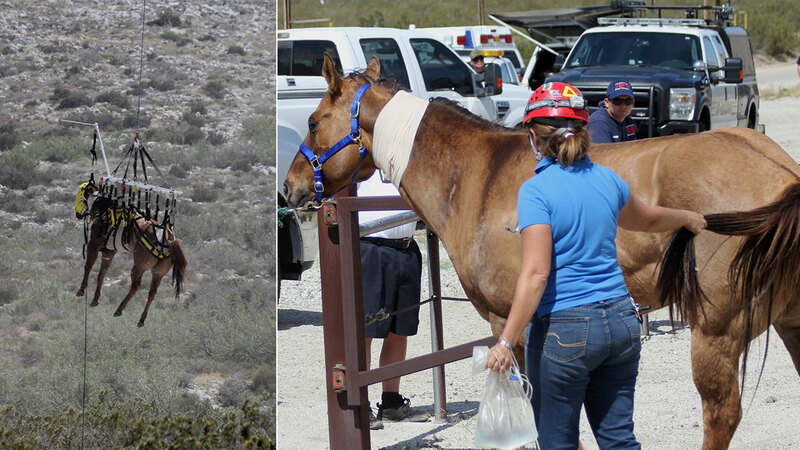 PALM SPRINGS, Calif. (KABC) -- A horse was rescued and airlifted out of a ravine in a remote area near Palm Springs Sunday afternoon after falling off a trail. Officials say three horses and their owners were on a volunteer mission Saturday when the animals became stuck on a steep mountain. One of the horses was able to free itself but a second horse named Mo died after suffering a traumatic brain injury. Riverside's Horse Animal Rescue Team, which consists of a group of firefighters, police, animal control officials and a veterinarian, responded to Snow Creek Sunday to airlift the third horse named Spirit out of the ravine. The team had to wait until daylight to rescue the horses but the horses' owners stayed with them overnight.